Tens of thousands of Indian migrant workers in Saudi Arabia are in dire need of sustenance, and have been facing severe food shortage. 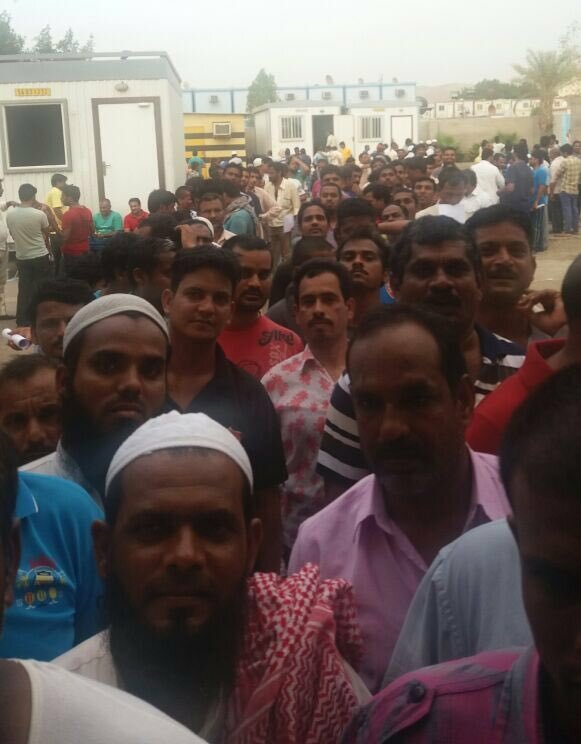 In what is dubbed a ‘humanitarian crisis’, there are at least 10,000 stranded Indians who work for Saudi Oger company. 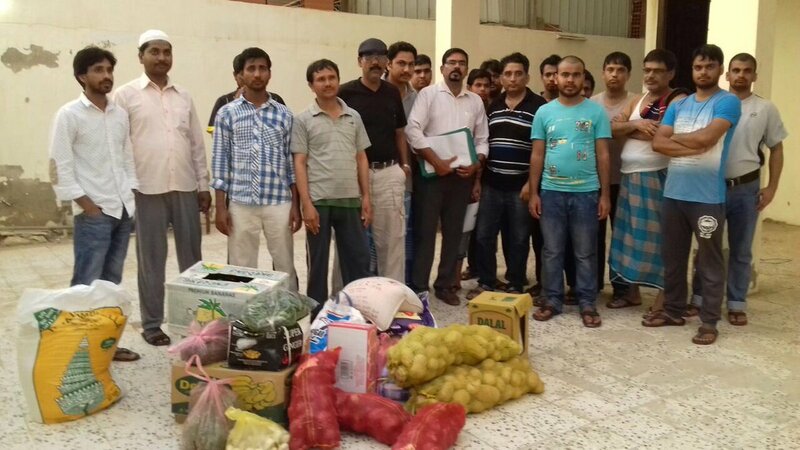 Latheef Thechy, an Indian social worker in Riyadh, and his friends are carrying out extensive relief work, using Whatsapp groups to coordinate food collection and follow up the cases. Indian Minister of External Affairs Sushma Swaraj has appealed to the 30,00,000-strong Indian community in Saudi to help the stranded workers. Even as Saudi officials show confidence in overcoming the oil price slump with their $750 billion in foreign exchange reserves, the private sector doesn’t reflect the same confidence. In the past few months, there has been continuing labor unrest, mainly over non-payment of wages. Earlier this year, videos of workers of the Bin Ladin group allegedly setting fire to a bus were circulated online. Other such similar incidents have been reported too. Saudi Arabia’s biggest construction companies, like the Bin Ladin group, have been affected drastically due to the oil price slump and migrant construction workers are bearing the brunt of the sector’s downturn. Earlier this year, the Bin Ladin group laid off 50,000 people, most of them construction -site workers from Asian countries. The company paid the outstanding salaries before dismissing the workers. According to economic forecasts, as global oil prices fell sharply, the Kingdom's income has dropped by more than $88 billion. “I don’t have an Ikkama (Labor card) too. If I go out, police catch me and put me behind bars for two or three days. 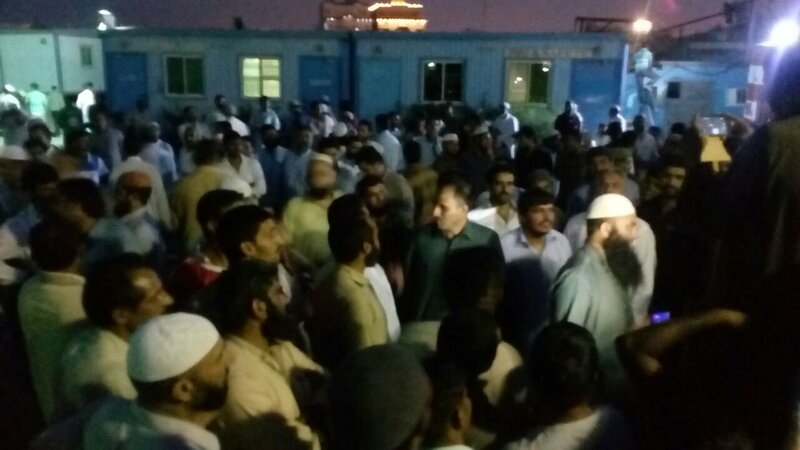 Last Saturday, hundreds of workers from the Saudi Oger company took to the streets in Jeddah to demand seven months of unpaid wages. “It is not only salary, for the last one week the company has stopped food supply and we were starving. 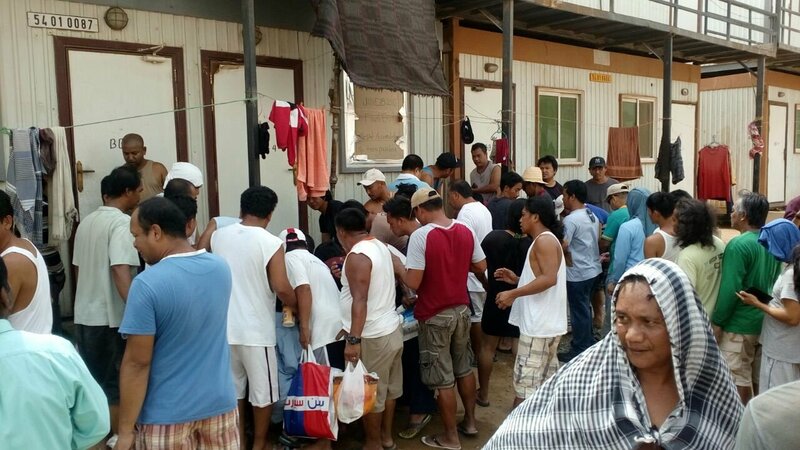 Thousands of Indian workers are languishing in the same condition at the company’s different camps,” Deepak Kumar, a stranded worker with Saudi Oger company from India, told Migrants-Rights.org. “I don’t have an Ikkama (Labor card) too. If I go out, police catch me and put me behind bars for two or three days. They also don’t provide us food. We are struggling a lot. Sometimes, Indian mission officials come and meet us. They assure help and vanish. Nothing is materializing. Pakistan and Philippine embassies are doing a lot more for their workers. We are left stranded,” the worker said. Swaraj has deputed Indian Ministers of State, Gen. (Retd.) V.K. Singh and M.J. Akbar, to talk to officials in the Kingdom and Kuwait to resolve the situation. Meanwhile, speaking to media, Akbar had said that Saudi authorities have assured that exit visas of affected Indian workers will be processed. While welcoming the exit visa move, many stranded were of the opinion that more than the exit visas - settling the end of service benefits - including the pending salaries, is what matters to them. “Going back empty handed is beyond our imagination,” Rishi PV, a member in the Whatsapp group wrote. Meanwhile, Babu G, another stranded worker, said that the company has already started procedures to repatriate the workers. “The company has advised us to fill the forms and keep receipts. It is understood that those who have plans to leave urgently will not receive any benefits,” Babu added. As majority of the workers’ Ikkamas have not been renewed, they are struggling to get medical aid and are unable to purchase SIM cards. “If somebody dies here with an invalid Ikkama, then the repatriation of their body will also be difficult,” Babu said while adding that situation is quite worrisome. Meanwhile, the Overseas Workers Welfare Administration (OWWA) for Philippine workers is being urged to consider repatriating the stranded overseas Filipino workers (OFWs) in the Kingdom already following the crisis. Earlier, the Department of Labor and Employment (DOLE) and OWWA had already identified nine beleaguered companies in the Kingdom as being the source of the more than 10,000 stranded OFWs. Meanwhile, the Philippine Overseas Employment Administration (POEA) said it is still reviewing the working conditions in five more companies in the KSA that have been hit by the financial crisis. On the other hand, the POEA head said they have stopped deploying overseas Filipino workers (OFWs) to Saudi Bin Ladin Group of Companies (SBG); Saudi Oger, Ltd. (SOL); Mohammed Al Mojil Group (MMG); and Mohammad Hameed Al-Bargash & Bros. Trading & Construction Co.
“We have suspended deployment to four biggest employers on that list, namely Saudi Oger; Saudi Bin Ladin group; Mohammed Al Mojil, and Al-Bargash,” according to POEA adminstrator Hans Cacdac. In March 2016 itself, the Saudi Labor Ministry had taken some measures to address these concerns. The government had stopped providing its services, including social security and passport affairs to Saudi Oger. A panel was formed to resolve the crisis; however, it has not turned out to be of much help for the workers. As Migrant-Rights.org reported earlier this week, ‘reforms’ of laws and regulations do little to help workers. The ongoing stream of laws and regulations drafted and implemented by Saudi’s labor and interior ministries reflect the entanglement of migration and domestic politics. The overall effect of these laws, and of the accompanying government narrative, reinforces the marginalization of migrant workers and immerses them in a society ever more hostile to their presence.